Ok... 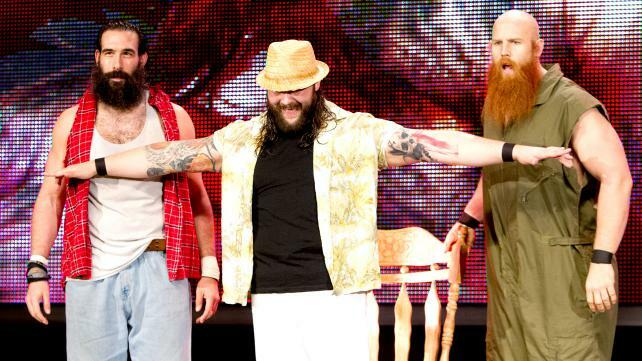 The Wyatt Family. they are good. They should fit in well. Froggy wrote: Ok... The Wyatt Family. they are good. They should fit in well. Is the guy in the middle Husky Harris from the Nexus?? So there's 3 of them. Will they be fighting the Shield? So if been flipping between raw and Chi-Det. I caught Jericho's highlight reel. Anyone else excited about Punk coming back in three weeks?? Im shocked it hasn't been brought up yet in this thread. Because the WWE hasn't been able to build a star in a very long time. So all of them have to be starts now to see which ones stick. It's HHH's way of doing things. That is a good thing IMO. I don't disagree, but they have to figure it out soon cuz the well is running dry. i think that's been one of the better developments in the last year or so. One of the biggest knocks on the WWE has been lack of new main eventers. I really like how aggressive HHH has been signing top end indie talent. The Shield are great. Ryback (even though i hate him) is a legitimate main eventer. Big E is good in his role. Then you have the Wyatt Family coming in soon, which is good... Kassius Ohno will be on raw very soon... I don't see Sami Zayn staying off TV very long... and, i read that it was officially announced today that Sami Callihan was signed to a developmental contract. they are kind of in the 'throw it at the wall and see what sticks' mode right now, but their track record has been pretty good as of late. i can't emphasize enough just how good the talent level is on NXT right now. So much potential. The Shield is excellent, I agree. Ryback needs more of a flamboyant gimmick to be a top star. He is too dry right now to garner much interest. It worked for Goldberg because you don't often see a face who is that bad***. If you're going to go with the "I can destroy anybody" routine it dries up quickly for the guys who are heels. She'sTheFastest wrote: The Shield is excellent, I agree. Ryback needs more of a flamboyant gimmick to be a top star. He is too dry right now to garner much interest. It worked for Goldberg because you don't often see a face who is that bad***. If you're going to go with the "I can destroy anybody" routine it dries up quickly for the guys who are heels. i didn't say he was a good main eventer, just that he is a guy who is credible in that role. Froggy wrote: i think that's been one of the better developments in the last year or so. One of the biggest knocks on the WWE has been lack of new main eventers. I really like how aggressive HHH has been signing top end indie talent. I agree with this 100% I also think if they want to build up Curtis Axel then he should beat Cena clean tonight. Well here comes Ryback as I type. Remember Kassius Ohno's name. he's going to be a huge star. Hopping on that bus waaaaaaaaaay early. Sorry if it sounds like I'm try to argue. I just meant to add to what you said. Yeah, seriously if they want to push the guy have him fight dudes who don't care about losing via pinfall or submission. Jericho would do it, I'm sure a guy like Orton wouldn't have the clout to say no etc. Nah. Power plant was a school. NXT is getting guys who already know what they are doing ready for tv. Froggy wrote: i flipped off raw for a bit... was it these guys? they have been on NXT for a while. The one on the left went by Brodie Lee in the indies, and is really damn good. Cashing in on the Duck Dynasty craze. You guys are really so hard into this? why visit the thread if you're going to pull that crap? really not wanted here, dude.